Tune in to APEX Express’ monthly South Asia spotlight to learn about the unique perspectives of two young women from Bay Area Solidarity Summer (BASS), a social justice training camp for young South Asian Americans in the bay area and beyond! 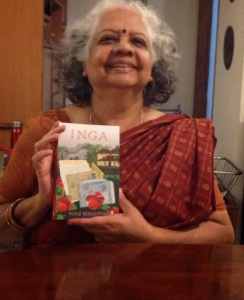 Later in the show, we bring you a lively discussion with noted children’s writer and playwright Poile Sengupta, about her latest novel for adults, Inga. Poile will be discussing her book on Monday Aug 31st at UC Berkeley at the ISAS. This South Asia special show is hosted and produced by Preeti Mangala Shekar.